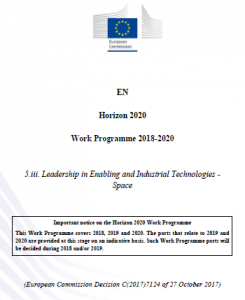 You can download the Horizon 2020 Space Work Programme 2018-2020. The Horizon 2020 Space Work Programme 2018-2020 will be updated by mid 2018 including details for the 2020 Calls. The associated guidance document for the Call topic SPACE-13-TEC-2019 for the SRC Electric Propulsion has been published by EC. The challenge of this strategic research cluster (SRC) is to enable major advances in Electric Propulsion (EP) for in-space operations and transportation, in order to contribute to guarantee the leadership through competitiveness and non-dependence of European capabilities in electric propulsion at world level within the 2020-2030 timeframe, always in coherence with the existing and planned developments at national, commercial and ESA level. The specific challenge of this action is to enable faster maturation of promising disruptive thruster concepts and technologies, as a necessary step towards demonstration actions. The detailed challenges are elaborated in the guidelines document ‘EPIC Roadmap’. A disruptive electric propulsion technology is a technology that disrupts a status quo in the space sector. It could replace the dominant technology by providing radical improvements in performance or costs which are perceived as valuable by a customer or part of the market, or it opens up new opportunities not possible with the incumbent technology. Emerging technologies that are potentially ‘disruptive’ often underperform compared to the dominant technology in early development phases – the underlying physics may not be fully understood for example and more R&D is required to properly ascertain performance attributes. Examples can be: disruptive improvement of performances, enabling of new operational scenarios, reducing costs of the full system etc. Thruster concepts or technologies for disruptive electric propulsion systems such as Helicon Plasma Thrusters (HPT), Electron Cyclotron Resonance plasma thrusters (ECR), Magneto Plasma Dynamic thrusters (MPD), Pulsed Plasma Thrusters (PPT), micro-propulsion electric thrusters, or any other innovative electric thruster concepts and relevant technologies for disruptive electric propulsion systems. Transversal concepts and technologies for disruptive electric propulsion systems, such as power condition electronics, direct drive, magnetic nozzles, alternative propellants, testing techniques, materials. Breakthrough technologies starting at low or very low TRL (<4), aiming to promote promising and potentially disruptive thrusters concepts in the field of Electric Propulsion. This should allow increasing of the current TRL, which in the long term could change the Electric Propulsion landscape. Promising technologies starting at higher TRL (≥) in the field of Electric Propulsion, enabling significant improvements of Electric Propulsion system performances, cost and fit to the market. The objective here is to allow to efficiently and effectively increase the TRL. Proposal for higher TRL should include the best possible combination of a market analysis and an application impact analysis. Proposals shall include a market analysis detailing the targeted applications and the specific key advantages of the proposed technology. Every disruptive effect shall be specifically correlated with its final application. Proposals shall not be based on technology lines mentioned in the call topic COMPET-3-2016-a for incremental EP technologies: Hall Effect Thrusters (HET); Gridded Ion Engines (GIE); High Efficiency Multistage Plasma Thrusters (HEMPT). The Commission considers that proposals for the disruptive technologies requesting a contribution from the EU of EUR 1 million for activities starting from TRL < 4 and of EUR 1 to 2 million for activities starting from TRL ≥4 would allow this specific challenge to be addressed appropriately. Nonetheless, this does not preclude submission and selection of proposals requesting other amounts. To promote and accelerate the development of potentially breakthrough EP or EP-related concepts and technologies in order to be able to provoke a disruption in the propulsion landscape in the medium to long-term. To foster the necessary long term evolutions needed to provide Europe with competitive and innovative electric propulsion products in order to maintain the European capacity to compete in the worldwide arena of electric propulsion satellites. To enable the identification and targeting of future markets and applications which are not yet addressed by the current well-established products or their expected improvements. Eligibility and admissibility conditions: No beneficiaries of the grant agreement EPIC (640199) will participate in consortia of proposals submitted under this topic of the call for proposals, with the exception of the DLR research institutes, Eurospace and SME4Space VZW. A maximum of two projects for transversal technologies shall be selected for funding. Grant Conditions: Grants awarded under this topic will be complementary to each other and complementary to grants awarded under topic COMPET-3–2014, sub-topic COMPET-3-2016-a and sub-topic COMPET-3-2016-b (“complementary grants”). In order to ensure a smooth and successful implementation of this Strategic Research Cluster (SRC), the beneficiaries of complementary grants (“complementary beneficiaries”) shall conclude a written “collaboration agreement”. The respective options of Article 2, Article 31.6 and Article 41.4 2 of the Model Grant Agreement will be applied. Consortium agreement: Members of consortium are required to conclude a consortium agreement, in principle prior to the signature of the grant agreement.